Everywhere the Lithuanian national team goes, a sea of green and yellow follows. Fans, flags, masks and drums; even away games have a home-like feeling. Lithuanian fans are arguably the best, most dedicated fans in the world, and they follow their basketball team everywhere. Yes, basketball. In the middle of a continent that worships soccer and the sport’s biggest stars, Lithuania is all about basketball. At the moment, Lithuanian fans have descended on Tel Aviv, Israel for the group stage of EuroBasket 2017. They’re at the beaches, restaurants, walking down the boulevard; you’ll know exactly who they are and where they’re from because they’re wearing their green and yellow “Leituva” t-shirts. The Lithuanian national team started competing internationally before World War II. The sport was introduced to the Baltic State by Pranas Lubinas, a Lithuanian who emigrated to the USA. When he returned home in the 1930s, he brought the sport of basketball with him. The team was successful from the beginning, winning the European championships in 1937 and 1939. But after WWII, and until the 1990s, there was no Lithuanian national team, and instead ethnic Lithuanians played for the USSR. In 1992 they returned to play as an independent state, their first major tournament was the 1992 Olympics in Barcelona. But how did Lithuania, a country surrounded by soccer and hockey loving states, become such a basketball-obsessed country? The fans attribute it to two things, one simple the other more complicated. 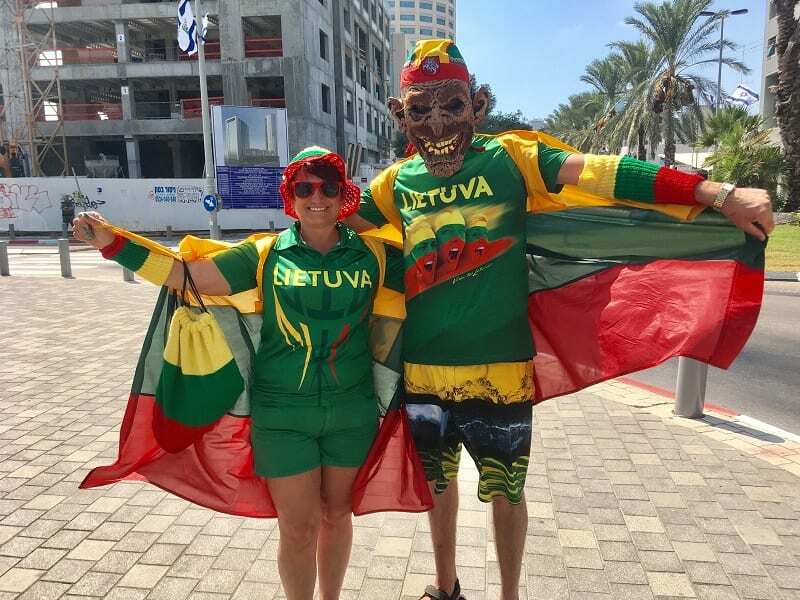 Algiras, a fan who arrived in Tel Aviv to watch Lithuania play in the team’s five Group B matches, attributes part of the sport’s popularity to the national team’s success. “Lithuania football (soccer) has no good player,” he tells Sports Retriever, while the basketball team has a long list of accomplishments. 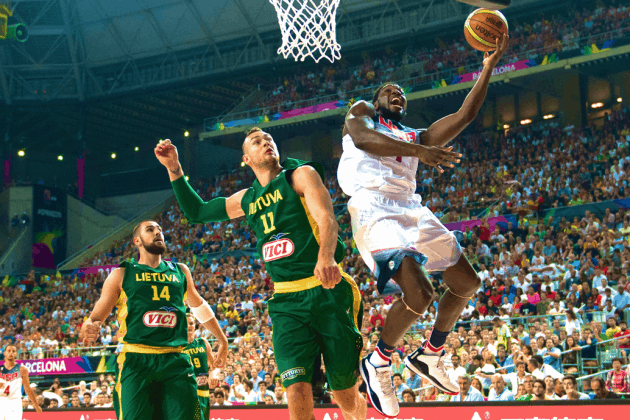 The men’s team was ranked fifth in the world by FIBA, and fourth in Europe after last summer’s Olympics. The only non-European team to crack FIBA’s top five in the world rankings is the USA. Since 1992, the team’s medal count has increased significantly and includes three Olympic bronze medals, from 1992, 1996 and 2000, a FIBA World Cup bronze from 2010, another EuroBasket gold from 2003, three EuroBasket silvers in 1995, 2013 and 2015 and a EuroBasket bronze from 2007. Lithuania even beat Team USA during the 2004 Olympics in Athens. The team didn’t win a medal that year, but they had a moment of glory fans are sure to remember. As for players, there’s a growing list of current and past Lithuanian NBA stars. Toronto’s 25-year-old Jonas Valanciunas is averaging 11.5 points and 8.5 rebounds a game in his five seasons so far in the NBA. Mindaugas Kuzminskas just wrapped up his first season playing with the Knicks, two-time All Star Zydrunas Ilgauskas spent 12 seasons in Cleveland and Arvydas Sabonis was inducted into the Hall of Fame in 2011. But how good the players and team are, and how successful they’ve been, is the simple answer to why basketball is so popular. Plenty of NBA stars have come from European countries, but those countries are still more focused on soccer. 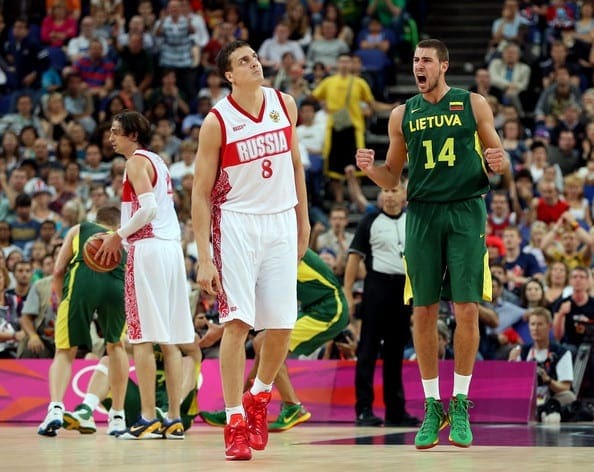 The more complicated answer as to why Lithuania’s no. 1 sport is basketball is a competitive one. Svajunas Masiulionis, a Lithuanian fan who has lived in Chicago for the past 21 years and traveled to Tel Aviv from the Windy City for the group stage, offered what may be a simple explanation for the complicated answer. Several Lithuanian fans cited the games against CSKA as part of the reason why the sport is so popular in a country of just 2.9 million people. But Masiulionis, who has been following the team to tournaments around the world since 2007, also offered a more lighthearted explanation. “Maybe a factor is that we have a lot of tall people, so it helps in this sport,” he jokes. At the end of the day, Lithuanian fans are more concerned with the team’s success than why the sport is more popular than others. When the team travels, you can be sure that the fans will be right beside them for the journey. From Rio last year, to Tel Aviv this past week and Tokyo in 2020. Watch out for that sea of yellow and green.